For much of her career, The Honourable Allyson Duncan has been a trailblazer. She was the first African American woman appointed to the United States Court of Appeals for the Fourth Circuit, the first African American woman to serve on the North Carolina Court of Appeals and the first African American to serve as President of the North Carolina Bar Association, and only the third woman to do so. But while Judge Duncan has enjoyed all of these successes, there are many more women and other minorities who have not been afforded the same opportunities. 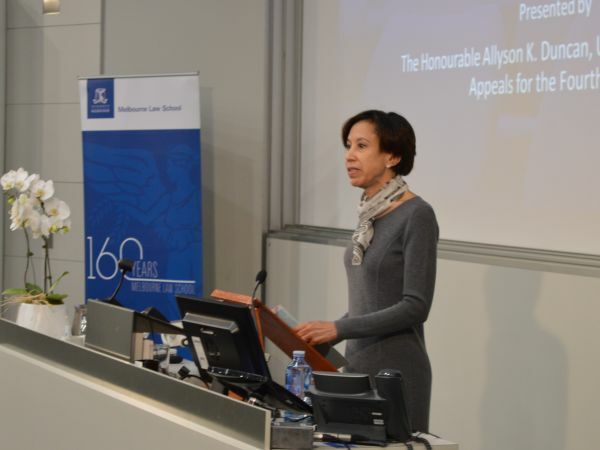 This is an issue close to Judge Duncan’s heart, and was the catalyst for her talk to an eager audience inside Room G08 at Melbourne Law School on Tuesday 4 April. The issue of diversity has taken Judge Duncan across the world. On her travels she has met various other women who, despite facing similar issues around equality, have also been elected to the highest levels of public office. Speaking to the likes of Laura Chinchilla (the first woman elected President of Costa Rica), Zarela Villanueva Monge (the first woman elected President of the Supreme Court of Justice in Costa Rica) and Judith Prakesh (the first woman appointed Permanent Judge of Appeal on the Court of Appeal in Singapore) “has added a level of nuance” to Judge Duncan’s perspective that few others possess. Judge Duncan believes gender equity is “critical…to the overall assessment of a society’s commitment to the rule of law.” Drawing on a vast array of empirical research, Judge Duncan demonstrated just how beneficial gender equity can be to societies across the world. “When international organisations set out to rank countries on their adherence to rule of law principles, the equality of treatment and absence toward discrimination are significant factors,” she said. “Not only is there a positive correlation between gender equity and rule of law generally, there’s also a positive correlation between gender equity and other rule of law factors as well. Judge Duncan added to this empirical data with anecdotes from her own experiences as an African American woman working in the law. She recounted her time in a large American law firm where she became the only African American woman partner, and one of only three female partners in the firm. “In fact, my husband and I used to laugh about it because he enjoyed the firm’s spousal retreats far more than I did. We would always go to lavish places and he was outnumbered by women by a significant percentage,” she said with a smile. But such light-heartedness does not hide the extent of the issue, particularly in the United States. Judge Duncan highlighted the pay gap that exists between men and women generally, while also touching on the prevalent leadership gap in many legal and non-legal firms. “Despite making up half of the work force in 2015, women are less than 5% of the CEOs of Fortune 500 companies,” she said. Judge Duncan closed her talk with a poignant point, one which she illustrated perfectly. Asking the question “why is diversity so important?” she answered by saying it needs to be at the heart of our justice system.